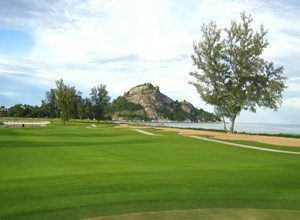 The newest Hua Hin golf course is the Sea Pine Golf Course (also known as the Army Golf Club II). This golf course opened is the pride of the Royal Thai Army and much better than any Thai municpal course I have seen. Designed by active Major General Weerayudth Phetbuasak (same designer as Suwan Country Club in Bangkok and Phokeethra Coutry Club in Siem Reap), Sea Pine is a good track with 4 holes longing the beach that play like a links-styled course. The majority of the other Sea Pine area is comprised of bracken pine trees and is enriched by the beauty of oceans and mountains. My favorite hole is the 16th, a long Par 5 with an exciting 2nd or 3rd shot. The hole is facing the sea which means depending on the direction of the wind it can be extremely long and very challenging especially for the design of the hole. In front of the green there is a huge lake to cross and just behind it the ocean. The difficulty is that the green is not deep so you must get the distance right! The view is absolutely astonishing. The maintenance of the golf course is generally good. If you want to play this Hua Hin golf course I recommend you to play weekdays. If there is a group of Thai army officials in front of you it can take more than 5 hours to play a round!. Otherwise, if you do encounter slow play, as they say in Thailand, never mind! You are on a Thai golf holiday, so enjoy the nice pine tree lined environment, ocean views, and a Singha or two! Just prepare yourself to this kind of eventuality and you will greatly enjoy your round at the new Hua Hin Sea Pine Golf Club.